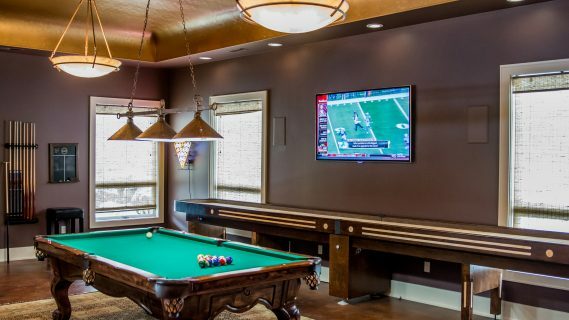 A mounted flat screen television has speakers discretely built into the wall. All equipment, wires and components are located in a centralized cabinet. 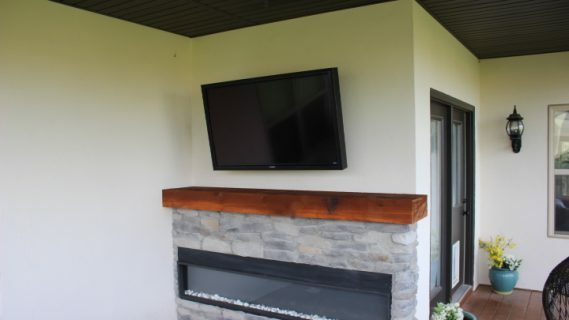 An outdoor television is mounted on the wall of a covered patio. 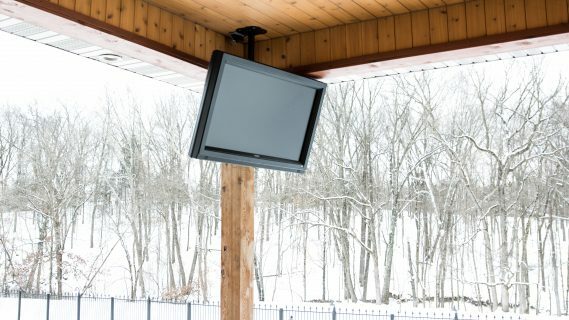 Outdoor-rated televisions can withstand year-round weather. 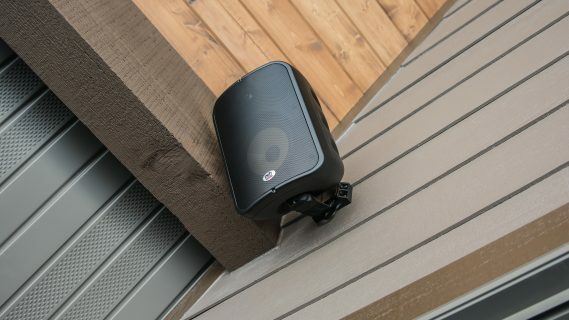 An outdoor weather-resistant speaker projects quality sound to a covered patio. Equipment is located inside and controlled by a smartphone app. 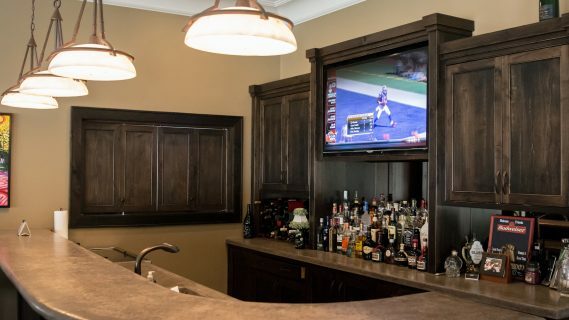 A mounted television sits in a media closet above a home bar. Video is distributed from a centralized closet to reduce components in bar area. 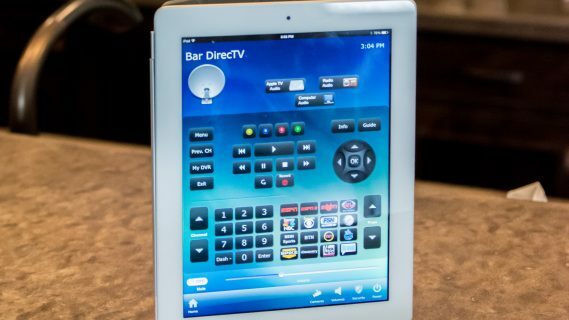 TV can be controlled by iPad app or designated remote. 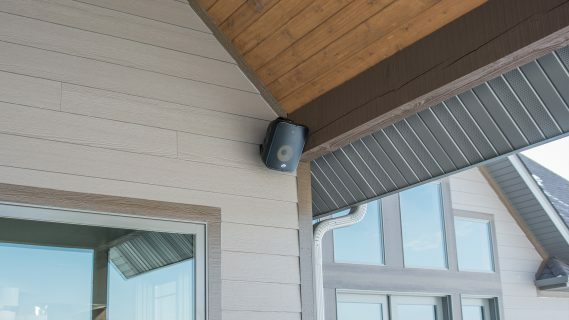 Pure Audio can mount televisions or speaker systems to enhance any outdoor entertainment system. 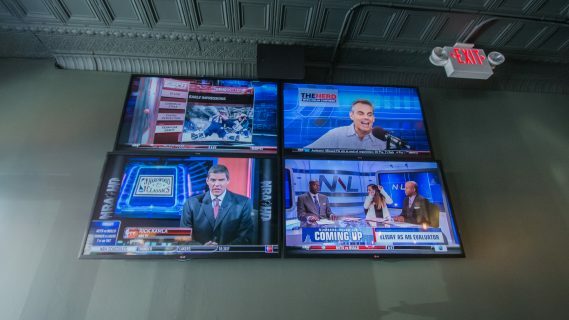 A quadrant of televisions equipped with DirecTV hangs mounted in a local bar. Each television has an independent feed and can play the same or different programs. 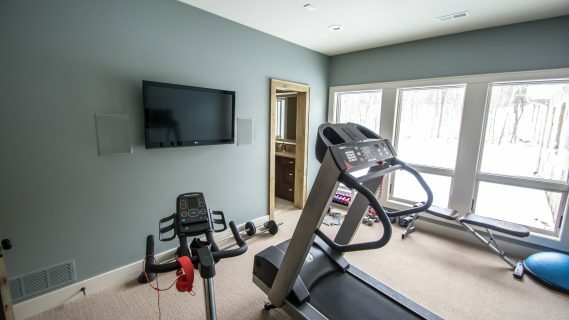 A mounted flat-panel television with in-wall speakers helps clear room for bigger equipment in this exercise room. Audio and video are distributed from a centralized closet and can be controlled from an iPhone, iPad or remote. A television hangs mounted above a fireplace in a living room. Wires are out of sight behind wall due to specialized prewiring during construction. 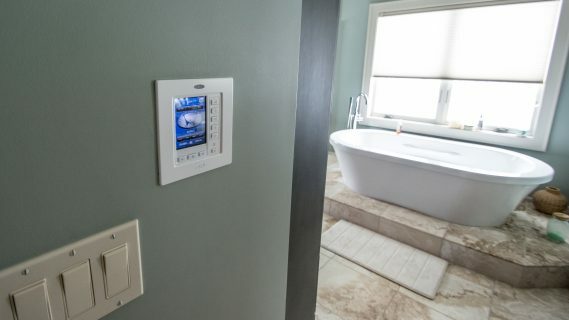 This in-wall touch panel controls audio and video in neighboring bathroom suite. 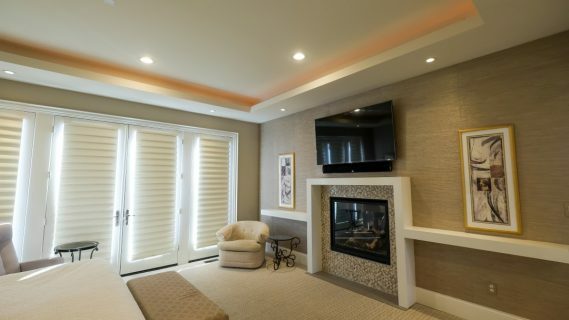 In-wall panels can control all parts of the home or just a specific area, and work with other remote controls. 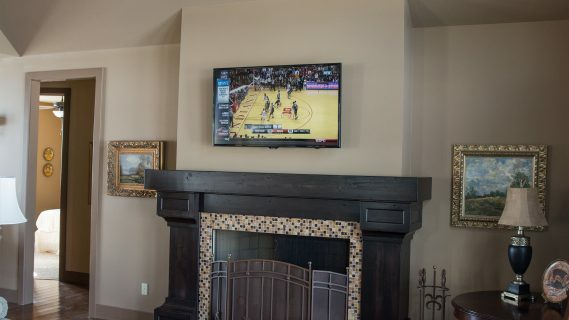 This television mounted above a fireplace has a three-speaker, in-ceiling surround system, which align with the vent for a consistent look. A golf tournament plays on a mounted television fed by a central video distribution room at a local banquet center. 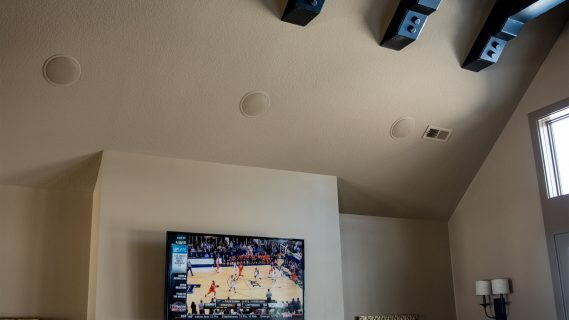 An HDMI port provides connectivity for local presentations and sound reinforcement is provided by in-ceiling speakers. The system is controlled from an in-wall touchscreen or a tablet. 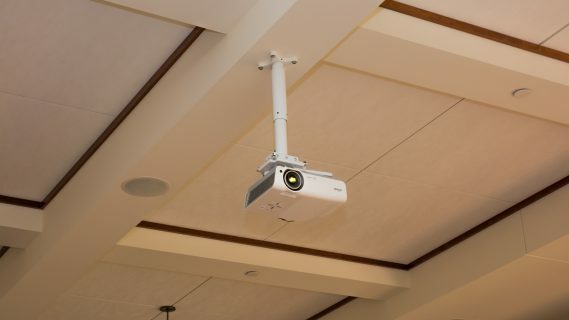 This mounted projector has in-ceiling speakers. 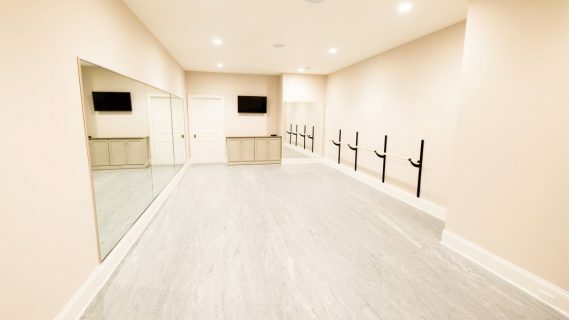 Audio and video are distributed from a central closet and controlled by an in-wall touch panel or wirelessly via tablet. The interface of a remote tablet app, which has capabilities to control multiple television sets and can be customized based on user preference. This mounted TV features hidden cabinets for components. Bookshelf speakers create a discrete look while providing sound reinforcement. 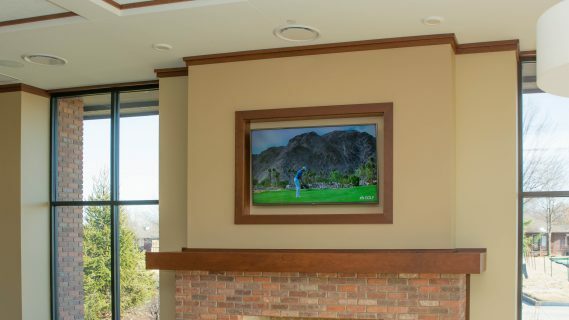 This indoor television is stored in an outdoor-rated case to protect it from the elements on a home's covered patio. The case has an articulating arm so watchers can change their viewing angles at any time. A soundbar discretely placed beneath the television enhances sound while also providing minimal interference with the room’s luxurious aesthetic. 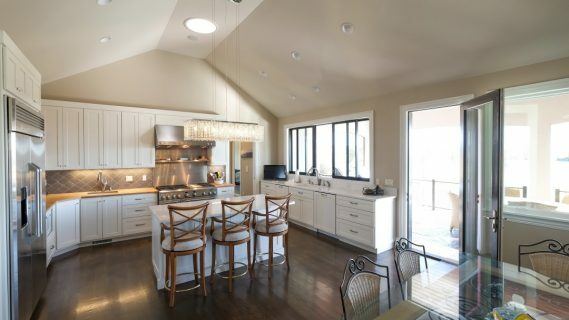 In this home, a flat-screen television occupies a corner counter in the kitchen. High-quality sound comes from a flush-mounted speaker in the ceiling, which blends perfectly into the space. 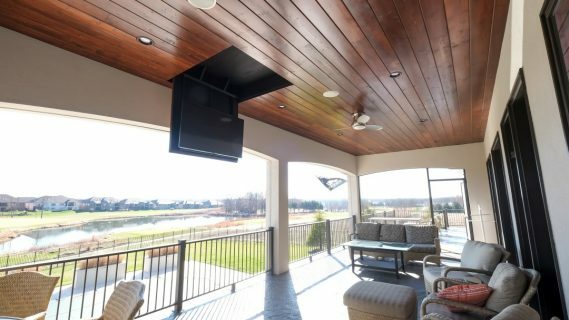 This television retracts into the wood-paneled ceiling on the deck using a motorized mount. 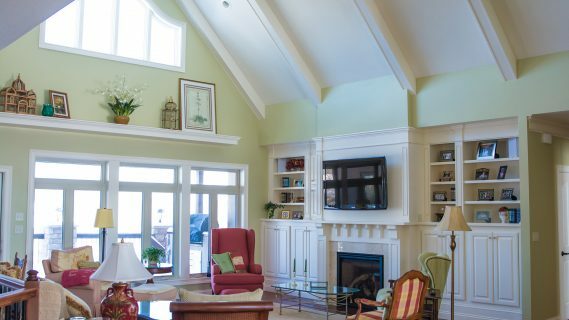 Recessed ceiling speakers provide vibrant audio while maintaining a clean look. This television has a soundbar installed underneath and components stored in a nearby cabinet. The system is controlled with a universal remote or iPhone app. The flat-screen television in this home’s dance studio complements its sleek look, while in-ceiling speakers reduce clutter. Equipment is housed in a nearby cabinet, and the system is controlled by an iPhone or iPad app.